Edit. Since I last wrote this post, which is almost three years ago, I have gained a ton of knowledge and experience in dealing with Lateral Pelvic Tilt. Oh, what a twisted pelvis can do to a person. Before I begin, I’ll note that my battle with lateral pelvic tilt has been well documented on this site. How I temporarily got rid of my tilt. 1. In August of 2011 I suffered horrible back spasms for two days. 4. The tilt returned (or never fully went away) due to a tight psoas muscle. I got relief by using an extra insole in the shoe of my low side pelvis. This leveled my pelvis and gave relief from pain, but did not address the real problem. Although the pain of the “daily-hurt-that-makes-life-miserable” variety had waned, I never felt quite right. I was still living with residual pain and stiffness. Quite literally, I was twisted. The left side of my pelvis was tipped and rotated forward and to the inside, meaning that instead of facing straight forward, it was oriented to my right. As a result, my spine, from the mid-back on up (around T8), had to twist to the left to keep me straight. So the situation is that the lower spine orients to the right as it moves with the left pelvis. The mid-spine then starts to compensate by twisting back to the left. What you’ll often see is someone with a left shoulder higher than the right shoulder. Notice the left shoulder higher than the right shoulder. The fascinating thing is that virtually all adults have a left pelvis that is forwardly rotated compared to the right. It’s completely natural due to our body’s internal asymmetries, the most obvious being that our right diaphragm is much bigger and stronger than the left diaphragm, thereby setting up a chain of events that allows the left pelvis to rotate to the right over time. The right diaphragm is bigger and stronger than the left diaphragm. The other fascinating thing is that virtually no one in the medical field knows about this condition. Apparently this information is not taught in physical therapy school or anywhere else. 1. Psoas ache and tightness in my left lower back, just above the pelvis. 2. Constant right hamstring tightness, calf tightness, and reduced range of motion in my right ankle. 3. Stiffness and pain when getting up from a seated position, particularly after driving. 4. Occasional right SI joint pain and discomfort that I attributed to my tight right hamstring and calf. The one constant was that though my pelvis looked level, I always “felt” my psoas muscle, like it was consistently agitated. The lateral pelvic tilt, when I had it, I could see clearly. It was caused by the tight psoas. Once the massage therapist got my psoas to unleash its death grip, my pelvis leveled out. On the other hand, the rotated left pelvis was not visible, so I didn’t know I had it. Plus, through all my reading and research, I have never read anything about it until taking a course from the Postural Restoration Institute. I decided to take the Myokinematic Restoration course through the Postural Restoration Institute for continuing education credits. The course is described as “an integrated approach to treatment of patterned lumbo-pelvic-femeroal pathomechanics”. A cursory glance at the written material gave me a feeling that the course was something that would benefit me both intellectually and physically. As the instructor was explaining the situation, and specifically mentioned an overactive psoas, it felt like he was talking directly to me. I was experiencing what he was describing. My left leg was slightly abducted (moved away from the mid-line of my body), slightly externally rotated (so my foot pointed out) and my hip was slightly flexed (can’t be seen). My right side compensated by doing the exact opposite, adducted (moved towards the mid-line of my body) internally rotated (femur turned in) and my hip was slightly over-extended (can’t be seen). If my pelvis was not tilted forward and in on the left side, this is what my foot positioning would look like when I looked down. It would be completely wrong. However, since my left sided pelvis was, in fact, rotated into the faulty position, the foot position shown above actually looked perfectly straight. Let me emphasize: the picture above is NOT the position you want to be in. But it IS the position I was in because my left pelvis had tilted forward and rotated in. The legs moved into the position above to compensate for my faulty pelvic positioning. The faulty pelvic position can’t be seen, but it was there. The abnormal foot position looked normal because of my faulty pelvic positioning. The trick is to reposition the pelvis on top of the legs, which, it seems, I have successfully done. I get more e-mails and comments about lateral pelvic tilt and anterior pelvic tilt that anything else. Unfortunately, there is no way for me to assess anyone or provide any definitive information on what may help. All the information I have provided in past posts is just general anatomy and what I have done to help myself. Going through a drawn out biomechanical explanation of how I fixed myself will do almost no one any good unless they are already extremely well versed in physical therapy and/or more advanced anatomical concepts, and even then it’s hard to understand. I have talked to numerous physical therapists about this issue and I realize they have no idea what I am talking about. The only thing I can do is refer you to the website of the Postural Restoration Institute. One of the tabs on the website is entitled “Find a Provider”. Click on that tab and you may find someone in your state who could help. 1. There are often musculo-skeletal reasons for back pain and usually these reasons can be addressed. 2. Don’t assume that all medical professionals are the same. They aren’t. I hadn’t seen anything like what I learned from the Postural Restoration Institute in anything I have ever read, and I assure you, I have read a lot. 3. Keep learning. If you aren’t intellectually curious about the human body, and you have an issue, you’d better get curious. 4. Never give up on anything that matters to you. Your health should matter–your body is truly your temple. Thanks for the post Neal. How long did it take you to fix it? Do you have to drive differently now? It took me exactly one workout. It sounds crazy, but true. It’s probably very easy for my body to fall back into the undesirable position because my body probably thinks this position is the normal position. All I’m doing now is reinforcing the new pelvic position with certain exercises that I got from the Postural Restoration Institute. My body feels completely different now. It’s exciting. I do my best to avoid putting my left foot on the foot rest, because the positioning puts my pelvis in a tilted position, and puts my left foot abducted, flexed, and externally rotated, which is the exact problem position to begin with. I guess the $400 course price tag was worth it. I’ll have to look into it. Yes, money well spent. Constant bodily hurt and the aggravation it causes can really kill a persons effectiveness. And if you enjoy the subject matter, it’s unbelievably interesting and powerful information. Totally makes sense to me! I am doing the same work with my PT and I’m pretty sure the handouts she gave me are from the PRI. I have gotten very familiar with a whole host of muscles you mention and more – psoas, TFL, adductors, QL, gluts and most important of all….the diaphragm. It’s amazing to contemplate and reflect on the impact of muscle imbalances in our bodies. Like you, I’ve spent a lot of time doing the trace back in my mind of how my pelvic tilt and rotation happened. I’ve come to a few conclusions – 1) emotional trauma activated psoas on the right side leaving it in a chronic tensed state that was the beginning of muscle dysfunction and imbalance 2) right side body is overly dominate and likes to do all the work, 3) postural habits which stem from item 2. The newest revelation is from my PT: breathing patterns. I favor the deepest lobe in my right lung and the most superficial lobe in my left lung and so the twist that is happening in my rib cage as a result of my breath pattern is directing the tilt and rotation of my pelvis. So a lot of work I’m doing now is to strength my diaphragm and breathe into the full capacity of my lungs and wake up and strength my core muscles to neutralize the arch in my low back so I come back into postural alignment and so I activate my parasympathetic nervous system. Complex stuff! Thanks for sharing your learnings!! The PRI is very big on breathing and the diaphragm. I plan on doing another one of their courses called Postural Respiration. I’m actually planning on doing a blog post on bodily pain, tracing back my earliest memories (10th grade back pain) to the current day. I find it amazing all the physical issues I’ve had to deal with and how much I’ve learned along the way. The PRI course has connected many of the dots for me. Thanks for the thoughts, Bobbi and keep on learning. I am experiencing the same exact thing that you went through. My pelvis is twisted and is rotated forward on the left. Not too sure what exactly caused it but I was involved in a car accident and was t-boned on the passenger side. My car spun out and hit the snowbank. Since then, I’ve been in lots of pain and my body has been compensating for it. The amount of walking or sitting or standing I could do in a period of time decreased. And at one point it was so bad, I was limping from having a twisted pelvis and couldn’t walk for more than 10 minutes. I did the adduction test and couldn’t go all the way down. I also have functional scoliosis from having a twisted base. One leg is shorter than the other. My sacrum is also rotated and has a backward rotation (L on R). My legs were actually orientated in the direction that you presented in this article. I was wondering why my left leg wanted to abduct (rotate outward) and right leg wanted to adduct (internally rotate). Due to a sedentary lifestyle after the car accident I’ve lost lots of core strength and glutes too. My hips have been popping out of place into the direction of the above as you mentioned. I am seeing a physiotherapist to address muscle imbalances around my hips (ims and strengthening exercises) and am seeing a rolfer to address fascia. I tried the 90/90 hip lift pelvis restoration exercise and sometimes it does the trick but it doesn’t stay. My ribcage feels like it’s torqued. I also do have a jaw misalignment (it doesn’t open simultaneously, no pain though). I do realize that my breathing pattern isn’t great, I hold my breath at times but I’ve been actively trying to address it as I’ve read your article on the ZOA. I am interested in finding a PRI provider but unfortunately I am in Canada (Edmonton). I was wondering if you have any advice or would be willing to share a couple of exercises for me to try out. If it seems like I’m heading in the right direction with the PRI exercises, I am willing to fly out to seek a PRI provider. Until then, I hope to hear from you and listen to your experience dealing with this. Unfortunately, PRI exercises are hard to do correctly, even though they don’t always look hard. There is a lot more going on than meets the eye. If one component of the exercise is missing, it likely won’t work. Also, it takes a trained PRI provider to ascertain what type of progress you are making. It’s not straight forward at all, even to people who have taken a few seminars. It takes time to understand how the whole picture comes together. There are PRI physical therapists in both Washington State and North Dakota. I think it would be good to call one of them to discuss your situation and see what they think about it. I don’t know how your car accident will (or will not) affect what PRI usually addresses, an underlying neuromuscular pattern that starts at the left pelvis and continues up into the rib cage and often neck (and the misaligned jaw often indicates a strong neck pattern). Hope that helps and I truly do wish you luck. I read some info that you may find helpful in solving your pelvic misaglinment issue, which could actually be related to your jaw misalignment. I hope it’s OK to post a link here. Or just google the terms pelvic misalignment jaw atlas. Take care. Hi, I have this going in the other direction from partially tearing the iliolumbar ligament on the right side about 9 months ago, both feet point to the right and torso is twisted to the left. A symptom I have that I never see mentioned anywhere online, and wanted to ask if you had it since your story is the closest thing to mine I’ve found, is that my vision is “twisted” like internally, so that regardless of rather or not I straighten my head out and look forward, I still feel like I’m twisted to the left in a way that can’t be straightened out and my field of view is always the left. Standing at the bottom of a staircase with feet square and forward evenly in the middle of the stairs looking up and it’s like the field of view to the left is greater and my right side is closer to the right wall, and if I stay looking up the staircase and position myself so that I feel like I’m looking as evenly up as possible (nothing in front of me is ever truly square, always has a distorted twist to it) and then look down at my feet, I’ll be to the left side of the stairs and my feet will both be pointing right. Also, when I walk it’s like the shoulder on the left side is pinned back further so that my torso is always looking left more than right, very hard to explain and extremely frustrating and I’ve spend thousands of dollars on chiropractors, x-rays, mri’s, and have fallen into depression over it because I no longer exercise the way I use to. It’s gotten better than when it first happened, but is very very slow progress that’s almost unnoticeable as it happens. Soon I’m going to a prolotherapy clinic to have stem cells and prp injected into the the iliolumbar and other ligaments of the sacrum/ilium area and hopefully this will get it fixed, as it’s obvious that this ligament is slow to heal as are most ligaments. Guess my question is, did you have distorted, twisted feeling vision from this? Also, did you notice that your psoas got rock hard if you turned you left foot inward? Thanks. Hi Blake. Sorry to hear about what is going on with you. Feet pointed to the right could definitely occur when your pelvis is oriented to the right. It all depends on how your legs compensate for the pelvis that is oriented to the right. Different people do different things. I compensated in a very typical way, but not everyone does. In regards to the torso rotated to the left, that is the typical pattern of compensation in the upper body. The fact that you tore your iliolumbar ligament will probably allow more rotation than you really should have, since that ligament is involved in limiting rotation (I forget to which side). There is something that can occur, and is discussed in PRI, called a Visual Midline Shift. I really don’t know much about it beyond what I have read online. You should look it up. If you think it sounds familiar to what you are experiencing, you would want to see a Neuro-optometrist. Where do you live, Blake? Thanks, I live in Memphis, TN. My psoas, QL, and other muscles in the area seem to be locked into a hard spasm that’s pulling my spine to the side, I could feel my body be pulled into this position immediately after the injury, as if the muscles panicked and had to do something to support the structure that had been damaged, and spine on the right side did feel detached from the pelvis, my stomach would just plop down to the left if I relaxed my core. I looked up the visual syndrome, I’m not sure this is what I have, although the visual distortions are similar, my body is physically doing the same thing that my vision is doing which leads me to believe it’s a physical positioning problem. I did some very light self work on the muscles mentioned after finding this blog and they are extremely sore and tender now, further leading me to believe that they are locked and causing this. X-rays show that my pelvis is uneven with the eyes being different sizes in different positions from each other. If I turn my right foot, which wants to turn outwards, inward to be straight forward, my TFL on the hip becomes rock hard, like it goes from feeling like a muscle to being like a bone there from this simple movement. I’m going to try to find a massage therapist who is good at getting into all of these muscles and releasing them. Did the therapist who released your psoas after 8 months go in through the side of your stomach, or another technique? Hopefully I can find someone who really knows how to work on them. I see that there is only one PRI trained person in my area and he works on the Grizzlies, I’ve contacted him to see if he’s accepting new patients, waiting to hear back. Thanks. In regards to the vision issue, it could be that you when you think you are straight, you are actually turning to the left in your upper body. That is a completely normal compensation to a right oriented pelvis and spine. Your pelvis/ spine/neck are oriented to the right, so the rib cage and upper neck/head react by counter-rotating back to the left in an attempt to stay straight. If I lie someone down on a bench who has a neck pattern, their neck rotation will be “limited” to the left. This is because their neck is already turning left because the spine beneath it is oriented right. So when they lay on the bench with their head “straight” looking straight up, I am actually looking at a neck/head that is counter-rotating to the left. It’s already approaching its end-range of motion to the left. So when I try to rotate the neck to the left, it doesn’t rotate much because it’s already rotated left as compensation. It will rotate to the right more easily since it’s not straight. Perhaps this type of scenario is adding to the visual puzzle that you are experiencing. Yes, I think it’s a combination of things going on from the dysfunction of the pelvis, which I think/hope is being caused by contracted psoas, QL, TFL, other muscles from injury to the iliolumbar ligament. From what I’ve read, the QL and psoas are affected by this ligament and will have to try to compensate if it is damaged, so it makes sense that I felt myself turned to the left after hurting it as these muscles contracted and pulled my pelvis out of alignment causing my torso to twist. My right leg that wants to turn outwards feels like it’s not seated right in the pelvis kinda how you described needing to get your left leg back under the pelvis, my right leg feels similar. My right shoulder is also higher in the mirror when I relax and I can usually see my right hip higher as well, when it first happened it was much more noticeable. The PRI trained therapist I contacted no longer lives in the area, so I think what I’m going to do is go ahead with my original plan of getting prp/stem cells injected into the iliolumbar and other ligaments of the sacrum and start searching for a good massage therapist in the area who can get to these muscles and see them 2-3x week, and hopefully the injections will start to have an effect on healing the damage so that the muscles can relax, and then I’ll schedule a trip to Hruska clinic and let them access and work on me to try to get things back in line. This sounds like my problem. I am working with my 3rd physical therapist with no improvement and don’t think they are properly diagnosing my problem. 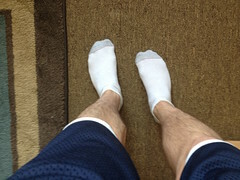 I am dealing with extreme muscle tension from hip to the foot in both legs. Right foot seems to want to flare out to the right. Hip tightness and tenderness at top of hip on the side. Working lacrosse ball for few weeks in the hip area provides temporary relief. I am see Postural Restoration trained PT next week. I am post surgery 6 months from l5 micro discectomy on left side which was successful, no back pain but as PT increased stability exercises the muscle tension increased to the point where it was difficult to push off on right foot. Muscle tension is worst in the hamstring, calf and running into foot. Do I need to see a massage therapist too to fix this problem? Hi Michael, I don’t think you need to see a massage therapist. The PRI therapist should be able to help. My pelvic tilt issues went undiagnosed by 2 orthopedic doctors and a chiropractor. I recommend finding an osteopath doctor who practices OMT (osteopathic manipulative therapy) and a massage therapist who specializes in NMT (neuromuscular massage therapy) aka trigger point massage. Before this I never really understood what osteopaths did but after doing some research I realized that they were exactly what I needed since they are trained and specialize in the muscluloskeletal system and will help realign your body using hands on manipulation. I only wish that I’d gone to them earlier as my undiagnosed pelvic tilt lead to a partial tear of my hip abductors, TFL and IT band confirmed via a pelvic MRI. Good luck. Upon reading this, its describing my pain to a tee. Ive been to chiropractors, massage therapists, physios all with the same answer Pelvic TIlt. But reading this it seems i have a twisted Pelvis…. Everything they say i should do (stretch, ice, sleep on back, rest) is not working. I am in Australia and i really would like advice on how to fix this once and for all. Is there anyway you could help me with this? Find an osteopath doctor who practices OMT (osteopathic manipulative therapy) and a massage therapist who specializes in NMT (neuromuscular massage therapy) aka trigger point massage. Hi, I can not believe I have finally found ppl who have similar problems to mine. I worked behind a salon chair for 30 years, having 4 sons while working. Had no idea my back had twisted into a debilitating negative 45°, I am totally worn down from exercises, but have narrowed spine to less than negative °10, but thoracic is still twisted, left side feels constricted still. My hamstrings are locked and it feels like my left hip joint will rip out if I try to stretch in external rotation. I do everything, but now I see through this post that nothing I’ve done will fix the twisted part of my spine. I am in so much pain that it is nauseating. I lost lost my husband in 2001, (he was shot and he died), I have four sons, I was severely depressed for 10 years and almost died. My son asked me to join CrossFit, (WOW what a joke). But actually was (besides choosing JESUS), the best thing I’ve ever done. I was always very athletic, but after all of the trauma and abuse to my body, I was twisted and locked up. I looser now but I’m still twisted. Please help me find out what to do to fix the twist. I am not wealthy and limited to what I can and can not do. But if I know that it WILL fix this, I will do my best to make it happen. It’s like this blog reached down from heaven and said, hey you are not crazy, you are not lazy, you are trying, but here is the hidden reason you are still crooked. Thank you for your knowledge and help, Sincerely, Untwist Me! I am seeing a chiropractor who is very different than the typical ones. I have been experiencing chronic back pain for twenty years and so tired of being tired all the time. The chiro identified my twisted pelvic which I have come to figure out in my and believe to be the source of all my problems. I have tried some many things and none have said this is the problem. She has a system that has adjusted the pelvic. The pelvic has held and now she is rebalancing my body. Here is my question: did you experience serious pain when you body was adjusting. I foolishly worked out too hard and have insane pain in my mid-back and bad lower abdominal pain (like gas). I am concerned and wondering if this is part of my body fighting this change combined with aggravating during my exercise. Sadly, she is on vacation this week and the pain started over the weekend. I’ve deduced that we have accordion compressed our selves. The pelvis has twisted under the compression of our upper body. (Caused by low self esteem usually). So.. We need to lengthen our spine, allow our shoulders to raise up. This allows more space for our lungs, more movement capability for our pelvis, more space for it to turn right, (or left). More space for our hip joints to release for improved appearance and walking. Higher shoulders helps to stretch the lats. The released lats allows more space for the psoas. The released psoas releases the thigh muscles. Only takes 5 to ten years to accomplish this, but hey, it took us 20 to. 50 years for us to get into this trouble. It can be done though.